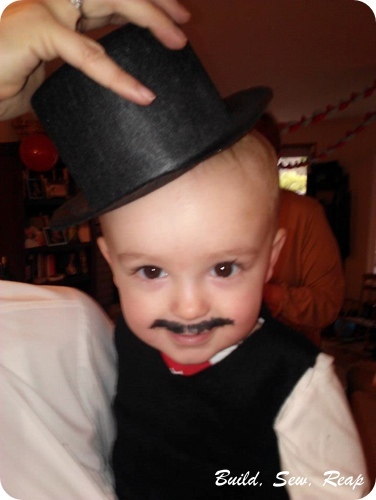 We had so much fun celebrating the baby's first birthday with a mustache themed party. It was exactly a month ago so it's high time I get this post written and published! 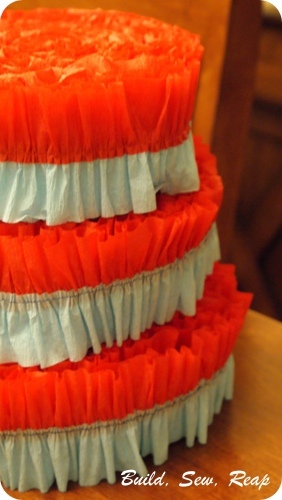 The crepe paper - I saw this post by Made awhile back and fell in love with the look. It was super simple to make (although admittedly it used a whole lot of thread) and the end result was fantastic. 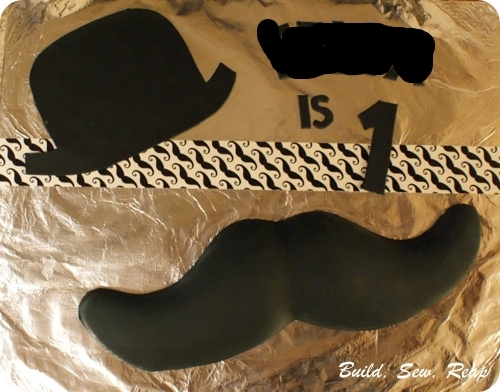 The cake - I picked up the mustache mold from Archie McPhees (although I saw it other places too) then created the hat and lettering out of fondant. I purchased the black fondant instead of making it myself and boy was that a worthwhile times saver!! 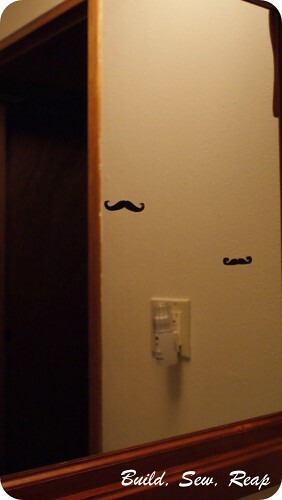 The random mustaches: I used my Silhouette to cut out a bunch of mustaches out of black vinyl and stuck them to just about everything including the bathroom mirror. There were several of them at different heights so guests could align their reflection with them to try them on. The Cocoa Bar - I posted about this part before. I put out cocoa and fixin's. It seemed so fitting for a cold December day. I also made chocolate and yellow candy mustache-on-a-sticks. I didn't get a good picture of them though and, well, they're loooonnnggg gone now. You can see them a little bit on the back corner of the cocoa bar in this picture. 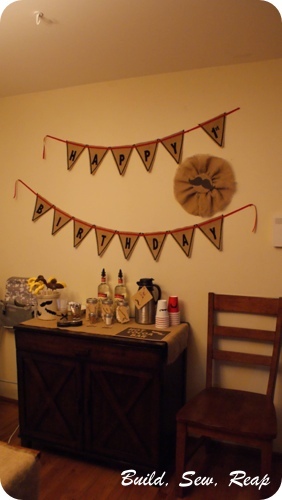 I used lots of burlap in the decorations including for the bunting, table cloths on both the cocoa bar as well as on the buffet table, around jars to hold plasticware and pretty much anywhere else I could find reason to stick it. 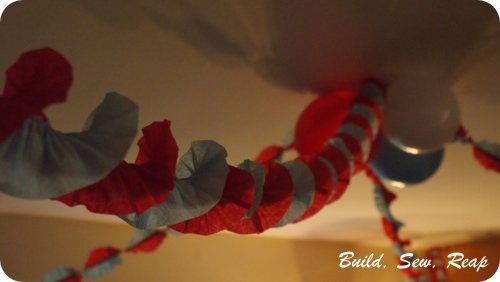 I really enjoyed working with it and hope to get a post up with some tips on successfully decorating with it. 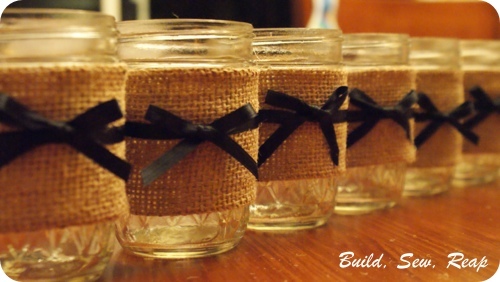 The Jars - I originally decorated these for us to drink cocoa from but then ended up using them to hold plasticware and other party necessities. 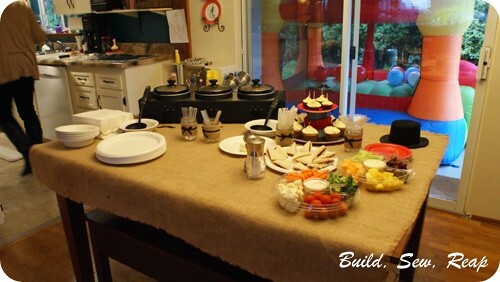 The Food - we had three homemade soups, bread (not yet on the table when this pic was taken), veggies and fruit. Yum!! Oh, and of course, the bouncy house was set up out back. Boy was that every a great purchase!! 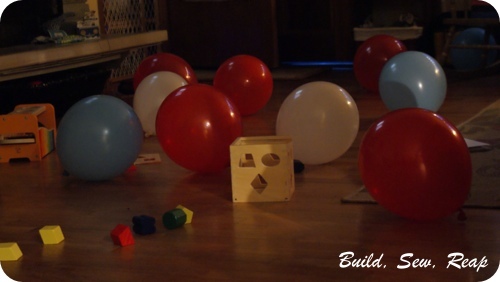 We bought that for the Snickerdoodle's 2nd birthday party and use it several times each year including birthday parties, play dates and random days when I feel like moving furniture in the living room to set it up for indoor chaos. 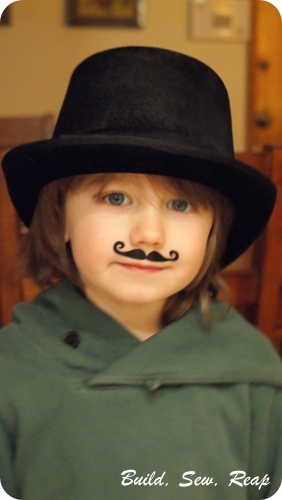 The Look: Mustaches and hats required. 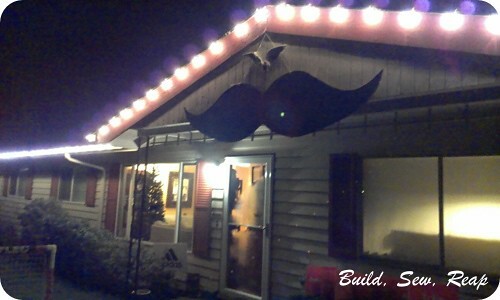 The Front of The House: Yep, an 8 foot mustache. The party was really fun. We could only really invite family to celebrate with us because it was too cold to have any of the party outside and our home is pretty cozy. 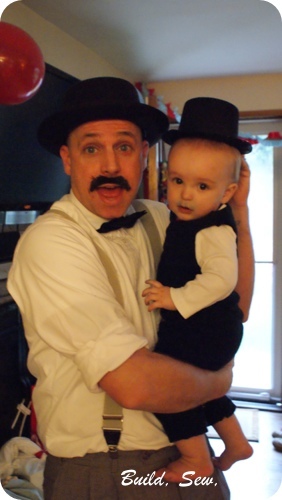 I think we might have to have another party this summer ... must start thinking of a theme. 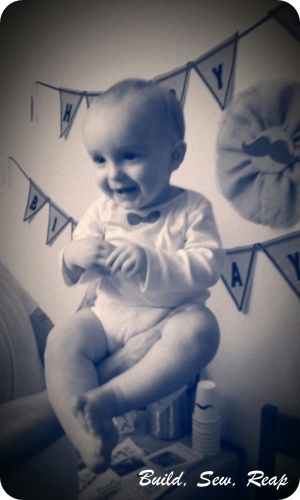 PS Happy First Birthday Sugar Pop! !